Inquiries and interview requests from journalists are managed by the Calgary Stampede’s media relations team in Calgary, AB. No matter how obscure your question may be, we’re here to help you get your story. Our goal is to keep you on the cutting edge of what’s happening through continuous website updates and regular news releases and media advisories. Looking for a story idea? Visit our story ideas page in our media resources section to get inspired. We also have access to an extensive library of photos you can use for storytelling. We know the media is instrumental in helping us celebrate western heritage all year, so our media team is committed to supporting you and earning your coverage. No matter what your question is about The Greatest Outdoor Show on Earth, we’re here to help you find the answer. The Calgary Stampede Broadcast Division is responsible for the production and distribution of the host broadcast feed, with all television and radio rights holders, production of all superboard and superscreen content, management of archival footage and the sales and distribution of all Rodeo and GMC Rangeland Derby footage. Email us to subscribe to our media release distribution list. Subscribe online to receive our regular email updates. Agriculture & Western Events are big business and big news. The Agriculture & Western Events Media committee (agmedia@calgarystampede.com) can put you in touch with the people you need to know and the information you need to have for all Stampede agriculture stories. Please visit our Calgary Stampede Agriculture page for an in-depth look at our agriculture news. 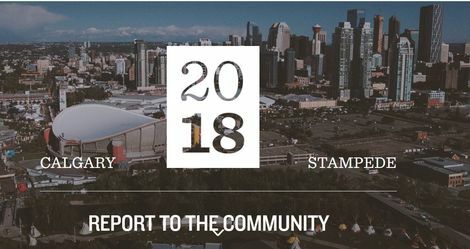 2018 Calgary Stampede media accreditation is now open! The Calgary Stampede welcomes media interest in our world-class event and we do our best to accommodate media coverage wherever possible.